Fibrous dysplasia is a benign disease where all components of normal bone are present, but they fail to differentiate into mature structures. It occurs as one of three clinical patterns:  involvement of a single bone (monostotic);  involvement of multiple bones (polyostotic) and  polyostotic disease, associated with café au lait skin pigmentations and endocrine abnormalities, especially precocious puberty (McCune-Albright syndrome). Management of temporal bone fibrous dysplasia is conservative. Surgery usually in the form of canaloplasty is performed in cases of complication like hearing loss, canal cholesteatoma. In this report we would like to give emphasis on the role of mastoid exploration in the treatment of fibrous dysplasia of temporal bone especially in context of hearing results. A 15 year old girl presented in the OPD with right sided hearing loss, on clinical examination, bony external auditory canal was found to be narrowed by a smooth oval mass arising from the posterior bony external canal wall beyond which tympanic membrane was not visible. On tuning fork test, Rinne was negative in right ear whereas in left ear Rinne was positive. On Weber test, sound was lateralized to right ear. Pure tone audiometry (PTA) revealed a moderately severe conductive type hearing loss in the right ear; the pure-tone average being 63.33 dBHL and air-bone gap (A-B gap) 48.33 dBHL. Hearing sensitivity in the left ear was within normal limit with PTA 15dBHL. Axial High resolution computed tomography (HRCT) of temporal bone revealed replacement of normal bony architecture by ground glass appearance especially involving the squamous and mastoid parts but sparing the otic capsule and the petrous apex. There was loss of normal cellularity of the mastoid air cell system and narrowing of the middle ear space but ossicles, cochlea-vestibular apparatus and Internal auditory canal (IAC) were normal. Computed tomography finding of left ear was within normal limit [Figure 1]. Canal wall down mastoidectomy by post-aural route was performed for excision of disease and restoration of hearing mechanism. Whole of mastoid bone including posterior canal wall was found to be replaced by spongy bone which was drilled out with care being taken to save the facial nerve which was eventually found to be in the normal position. There was cholesteatoma in the external auditory canal distal to occlusion. The middle ear cavity was not involved, also the ossicular chain was found to be intact and mobile. The resultant cavity was partially obliterated with rotated temporalis muscle flap and covered with temporalis fascia. Histopathological examination with haematoxylin and eosin stain under 10 × 10 magnification showed narrow, curved and misshaped bone trabeculae interspersed with fibrous tissue of variable cellularity which is diagnostic of fibrous dysplasia. Post operative Pure Tone Audiometry after 6 months showed mild conductive deafness. Pure Tone Average was 38.33 dBHL and (A-B gap) 26.67 dBHL. In the left ear, hearing sensitivity was within normal limit with Pure Tone Average of 11.67 dBHL. A 45 year old male presented with left sided hearing loss and otorrohea for 7 year duration. He also had a swelling over the temporal region for the same duration. There was history of mastoid exploration 4 years back. On clinical examination, active mucopurulent scanty foul smelling discharge was present along with narrowing of external auditory canal. Tympanic membrane was not visible. On tuning fork test, Rinne was negative in left ear whereas in right ear Rinne was positive. On Weber test, sound was lateralized to right ear. Pure Tone Audiometry (PTA) revealed a moderately severe mixed type of hearing loss in the left ear; the pure-tone average was 74 dBHL with AB gap 35 dBHL. Hearing in the right ear was normal. 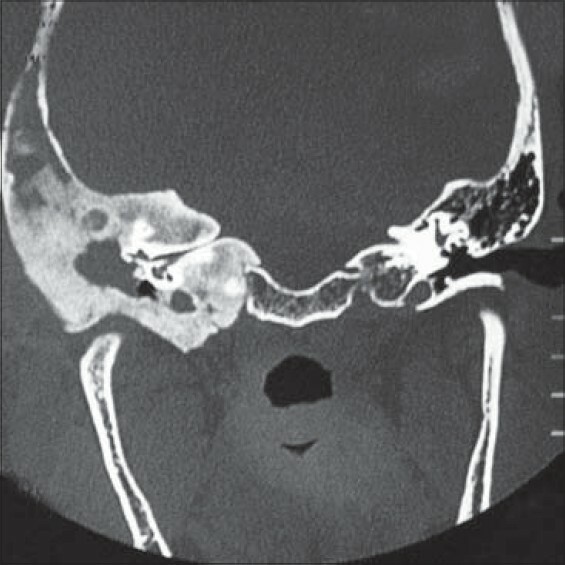 Axial HRCT of temporal bone showed replacement of normal bony architecture by ground glass appearance involving the squamous, mastoid and petrous parts of temporal bone with narrowing of the porus acousticus. The intact fallopian canal could be seen (labyrinthine and tympanic segment along with Greater superficial petrosal nerve (GSPN). There was a soft tissue density filling the mastoid and middle ear cavity. 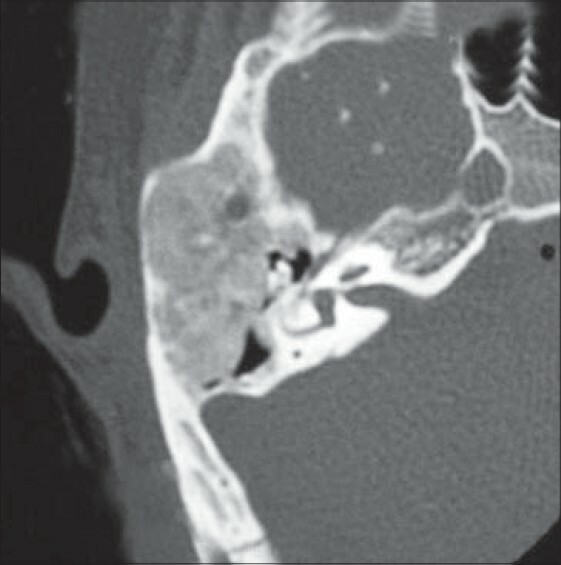 Coronal scan showed narrowing of the porus of IAC but relatively normal fundus and cochleovestibular apparatus [Figure 2]. Revision mastoidectomy was performed. During the surgery canal cholesteatoma was found and removed. Bony dysplastic mass was drilled away as far as possible. Only stapes superstructure was present. A type III tympanoplasty was performed and concho-meatoplasty was done. HPE report of excised tissue confirmed the diagnosis of fibrous dysplasia. Post operative PTA revealed no hearing improvement. Von Recklinghausen is credited with first pathologic description of fibrous dysplasia in 1891. McCune and Bruch and Albright and co-workers in separate publications mentioned about the term osteodystrophia fibrosa disseminate, characterized by endocrinopathies, cutaneous hyperpigmentation and precocious puberty in females in 1937. In the following year Lichtenstein coined the terms fibrous dysplasia and polyostotic fibrous dysplasia. The most common symptom of temporal bone fibrous dysplasia (TBFD) is progressive conductive hearing loss caused by occlusion of the eustachian tube or external auditory canal. Sensorineural hearing loss can also be attributed to this lesion, which is seen in 14-17% of patients. This occurs due to spreading infection or penetration of inflammatory product and toxins through the round window into the inner ear. This in turn results in cochlear destruction, internal auditory canal stenosis or vestibular fistulization. Facial nerve involvement is seen in 10% of these cases, cholesteatoma behind a stenotic external auditory canal may be found in upto 40% of patients which can lead to ossicular erosion. Other symptoms include tinnitus, dizziness, atypical facial pain and trismus. Three classic radiologic findings of fibrous dysplasia on plain radiographs are described-pagetoid, sclerotic and myxoid. Computed tomography is the investigation of choice for diagnosis and follow-up because of its superior bony detail and accurate assessment of the extent of the lesion. CT scan helps in differentiating fibrous dysplasia from other osteodystrophic lesions of the skull base, like otosclerosis, osteogenesis imperfecta, Paget disease, and osteopetrosis. Diagnostic characteristics of fibrous dysplasia on CT are "ground-glass" appearance and the presence of cyst like changes. There is often a clear tissue plane between affected and unaffected bone. In this case report the first patient had a severe conductive hearing loss with involvement of the mastoid by spongy bone and complete occlusion of the external auditory canal. Consequently a canal wall down procedure was required as whole of the posterior bony canal wall was involved by the disease process. The middle ear cavity including the ossicular chain was free from disease. This patient had significant hearing improvement after the surgery. Conductive hearing loss in this patient was due to occlusion of External Auditory Canal (EAC) impeding sound transmission. Reason for improvement following surgery in the following case was due to removal of the narrowing created by the disease process along with a wide concho-meatoplasty thus improving sound transmission through the neo tympanic membrane. In the second case, patient underwent surgery because of canal cholesteatoma as evidenced by HRCT scan showing soft tissue mass. The patient presented with mixed hearing loss due to involvement of EAC and internal auditory canal and also may be due to previous surgical intervention. In this case, there was cholesteatoma in the external auditory canal, middle ear and the mastoid cavity. Canal wall down mastoidectomy was done to remove the cholesteatoma as well as the dysplastic bone. Morrissey et al., in his study suggested that element of Sensorineural hearing loss may improve after decompression of IAC. However in the second patient IAC decompression was not attempted in view of the presence of cholesteatoma and the post-operative hearing level was similar to the pre-operative state. The probable reason for no improvement of hearing level inspite of mastoidectomy with type 3 tympanoplasty is because of IAC involvement and also may be due to previous surgery. These two cases provided us with valuable information regarding the symptomatology and progression of this uncommon disease. Though canaloplasty is the most commonly performed surgery for symptomatic TBFD, but a more extensive surgery may be needed in some cases. The treatment protocol of each patient of TBFD needs to be individualized depending on the symptomatology and extent of the disease. Hearing improvement in TBFD is possible following surgical intervention if there is no involvement of petrous bone including internal auditory canal or cochlea-vestibular apparatus. A canal wall down procedure is helpful in removing squamous epithelium (cholesteatoma) or in cases of mastoid involvement by fibrous dysplasia. Patients often need a wide concho-meatoplasty along with mastoid exploration because canaloplasty alone may lead to recurrence of the disease and its symptoms. 1. Heller AJ, DiNardo LJ, Massey D. Fibrous dysplasia, chondrosarcoma and McCune-Albright syndrome. Am J Otolaryngol 2001;22:297-301. 2. Lustig LR, Holliday MJ, McCarthy EF, Nager GT. Fibrous dysplasia involving the skull base and temporal bone. Arch Otolaryngol Head Neck Surg 2001;127:1239-47. 3. Cai M, Ma L, Xu G, Gruen P, Li J, Yang M, et al. Clinical and radiological observation in a surgical series of 36 cases of fibrous dysplasia of the skull. Clin Neurol Neurosurg 2012;114:254-9. 4. Lambert PR, Brackmann DE. Fibrous dysplasia of the temporal bone: The use of computerized tomography. Otolaryngol Head Neck Surg 1984;92:461-7. 5. Megerian CA, Sofferman RA, McKenna MJ, Eavey RD, Nadol JB Jr. Fibrous dysplasia of the temporal bone: Ten new cases demonstrating the spectrum of otologic sequelae. Am J Otol 1995;16:408-19. 6. Nager G, Kennedy D, Kopstein E. Fibrous dysplasia: A review of the literature and its manifestations in the temporal bone. Ann Otol Rhinol Laryngol (Suppl) 1982;92:1-52. 7. Tehranzadeh J, Fung Y, Donohue M, Anavim A, Pribram HW. Computed tomography of Paget disease of the skull versus fibrous dysplasia. Skeletal Radiol 1998;27:664-72. 8. Fakhri S, Levental M, Rochon L, Rappaport JM. Fibrous dysplasia of the temporal bone. J Otolaryngol 2003;32:132-5. 9. Morrissey DD, Talbot JM, Schleuning AJ. Fibrous dysplasia of the temporal bone: Reversal of sensorineural hearing loss after decompression of the internal auditory canal. Laryngoscope 1997;107:1336-4.